This probably looks like a weed to you. It would look like a weed to me, too, if it weren’t for the yellow tent stake and the plant label. The label says “Cardinal flower” (Lobelia cardinalis) and I bought it for a buck at the members-only plant sale of the Adirondack (really Finger Lakes) chapter of the North American Rock Garden Society (AC-NARGS) and planted it at the edge of the used-to-be pond. 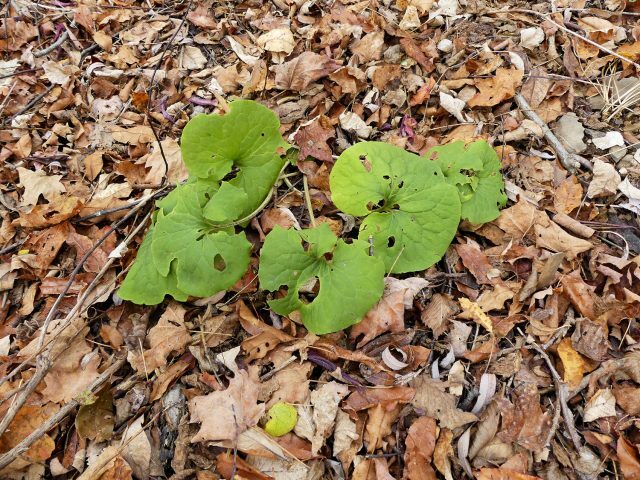 I was excited to see the rosette of leaves (at the arrow) because that shows this plant is settling in. 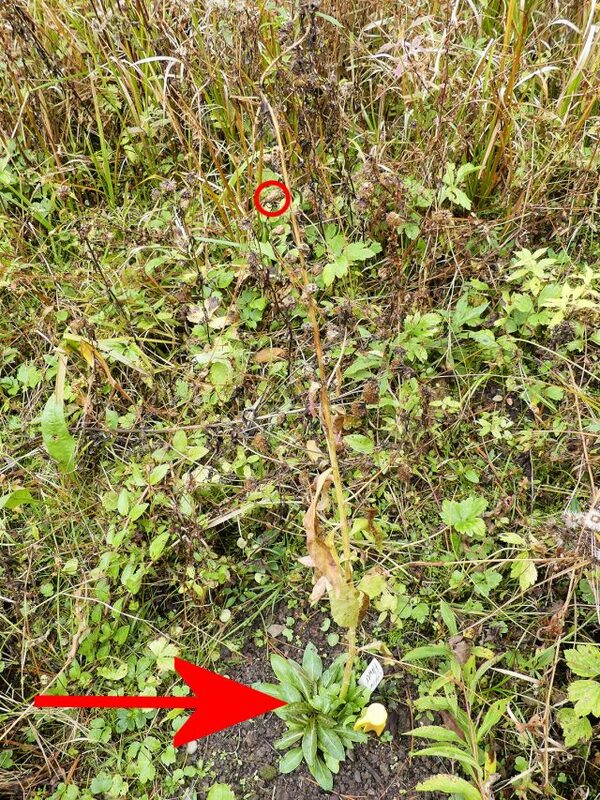 I am hoping that the seed pods (one is circled) find congenial spots to germinate, and in a few years there will be a patch of cardinal flower growing here. We are fortunate to live on ten acres of rural land. 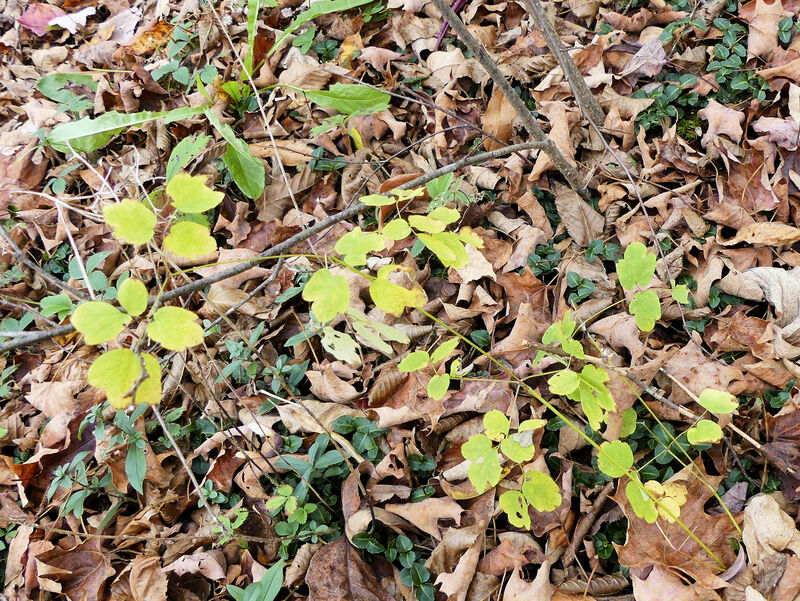 Most of it is second-growth forest, but I believe a bit along the edge of the creek may never have been cultivated. Some of my favorite memories are of walking in the woods with my uncle leading the way, so it wasn’t long after we moved here that I started carving paths through the woods. Carving is probably too strong a word–I discovered deer trails already there and widened them for human feet. (Read more about the Secret Garden here.) And since one of the pleasures of walking in the woods is discovering wildflowers as I stroll, it wasn’t long before I was adding more to what was already there. My focus has been on plants native to the northeast of North America, especially if I’ve already seen them growing locally. I started growing Allegheny spurge (Pachysandra procumbens) on the northern side of our former house, and brought it here when we moved. I’ve planted it in several spots in the Secret Garden. The Lady Bird Johnson Wildflower Center says it’s hardy to USDA Zone 6, but it’s been growing fine in my cold Zone 5 garden. And since we live on the Allegheny Plateau, I like that it’s called Allegheny spurge. I’ve seen hobblebush (Viburnum alnifolium) growing just down the street, so it was a no-brainer planting some here. I always try to match the habitat that the plants naturally grow in. I had noticed that hobblebush grows in patches of spring sunlight near the creek, so I picked a similar spot along our side creek. Wild ginger (Asarum canadense) looks rather beat up at the end of the growing season. It’s also planted in several places in the Secret Garden. 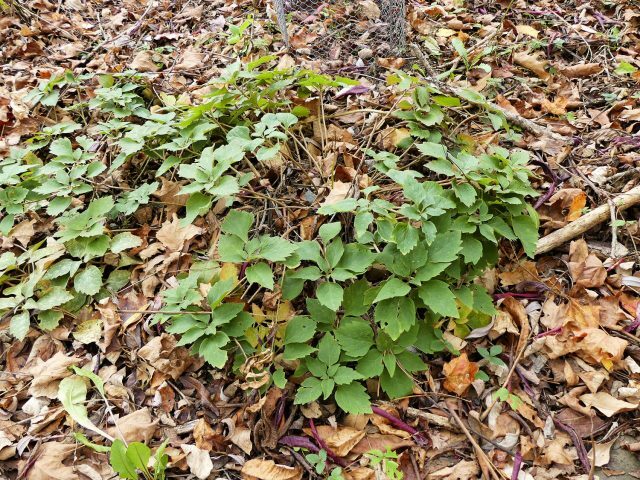 Tall meadow rue (Thalictrum pubescens) was growing at our former home when we moved in. I brought some over and have it planted by the house, and also in the Secret Garden. I saw roseshell azalea (Rhododendron prinophyllum) growing along the road a few miles from our former home, and finally found some quart pots of it online. It’s still very tiny–the red leaves are it. 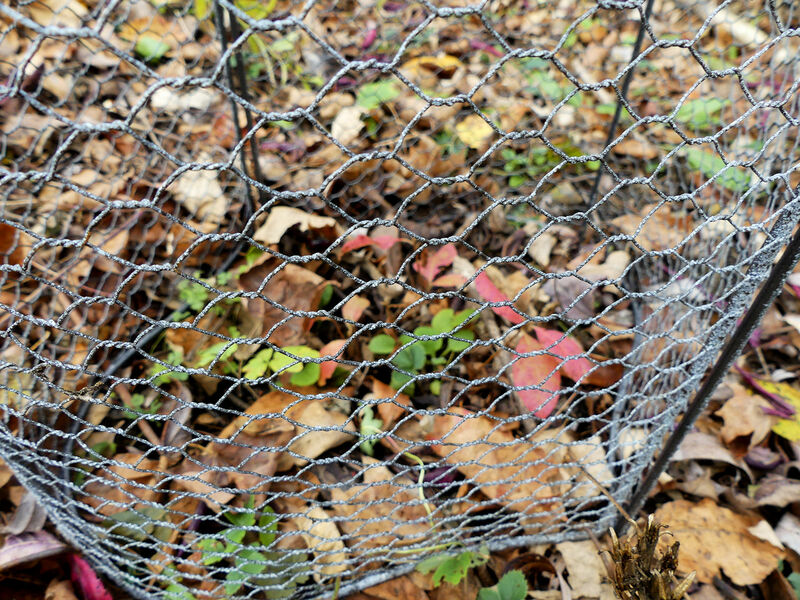 I use a 3-in-1 chicken wire cloche from Gardener’s Supply (affiliate link) to protect it from deer and rodents. It’s kind of pricey, but it’s more attractive than anything I’ve been able to fashion myself. 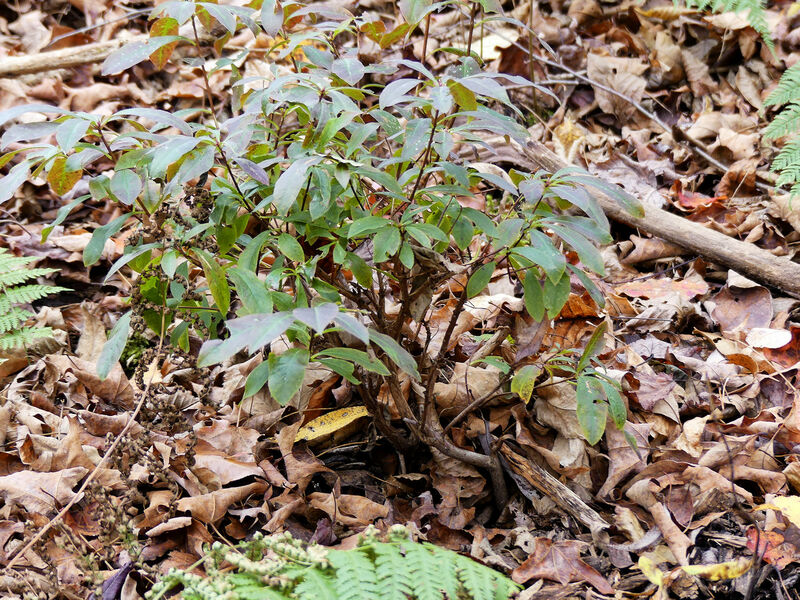 I was able to find swamp azalea (Rhodendron viscosum) in a larger size. I bought three, but only one made it. I didn’t realize when I planted them that swamp azalea likes really moist soil, but not an actual swamp. The two I planted in the wettest part of the Secret Garden didn’t make it. I planted the third one at the edge of that wet area and it’s thriving. I can hardly wait to see it bloom! This is the Blue Moon phlox (Phlox divaricata) that I raved about last year. I divided it and hope to have an even more beautiful scene next year. 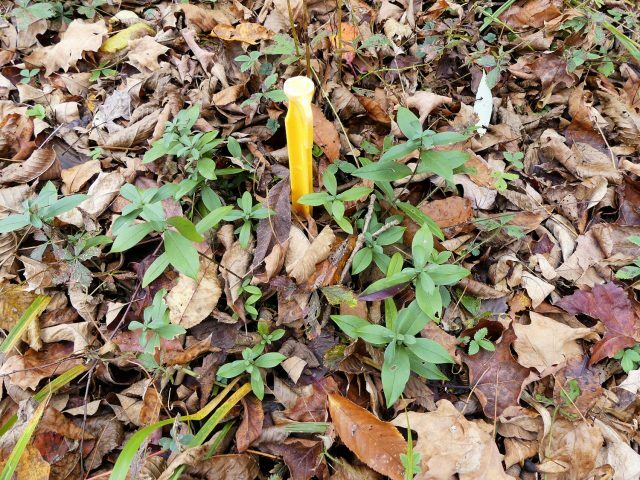 You’ve probably noticed those yellow tent stakes. I buy the cheapest ones I can find and use them to mark plants that I don’t want to lose track of. As you’ve probably noticed, many of these plants don’t look like much when they’re out of bloom. Many more of my favorites go dormant, leaving no evidence that they even exist above ground. I wouldn’t want to dig up a trillium by mistake, and the tent stake lets me know something special is in that spot–even if I can’t see it. I’ve had this fringe tree (Chionanthus virginicus) for three years, and it grows so slowly! It also emerges from dormancy quite late, so I always think it’s died on me. This has an actual cage of chicken wire around it, which is overkill–way larger than the little baby tree. But Gardener’s Supply didn’t sell those cloches back then, and I was paranoid about deer. Here’s my latest acquisition: ‘Cloud 9’ flowering dogwood (Cornus florida). 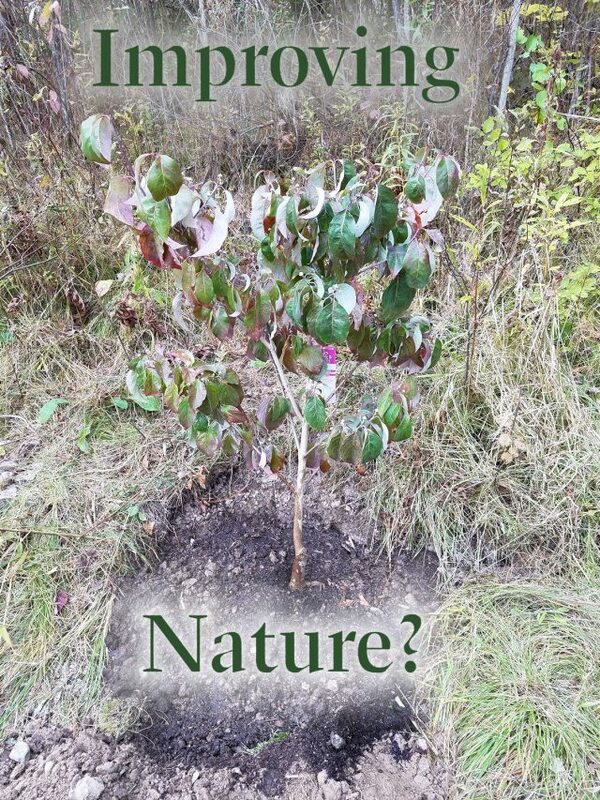 I am at the very edge of this dogwood’s native range. There was one growing wild about a mile down the road from our former house. But the bloom on it was always rather scraggly. ‘Cloud 9’ is reputed to have the cold-hardiest buds of any flowering dogwood cultivar. I planted it on the far bank of the back creek, so we can see it from our deck when it blooms. There are next year’s flower buds on it, so–fingers crossed! Some would say that you can’t improve on Nature. Maybe that’s true of completely undisturbed land, but this is second-growth forest. The original trees were cut down to make pasture for cows. The land around us was modified before I showed up. I admit it: it’s not natural. It’s a further extension of my garden, a very naturalistic garden, a managed wildness. I find it improved, because I am adding plants I approve of. 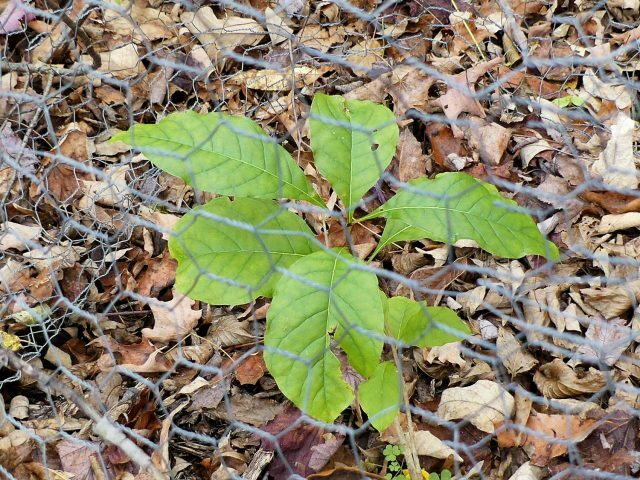 And I’m not only adding plants–I’m also removing invasive plants, clipping branches that interfere with walking the paths, and removing dead logs that block the trails. I will be very happy if the plants I have added become self-sustaining, incorporated into the habitat that is already there. I already get such joy from wandering around, taking note of changes and envisioning even greater beauty in the future. LOVE! This is my method at our lake property – adding native plants to the existing natural landscape. I love the lake for its natural vegetation and do not want a garden there per say, just a few more native blooms or that shrub that I don’t have room for in a suburban setting. May I suggest Pagoda Dogwood? It has an umbilical bloom but the most delicious, dark berries (for the birds), and the beautiful Dogwood leaf. Hardy! 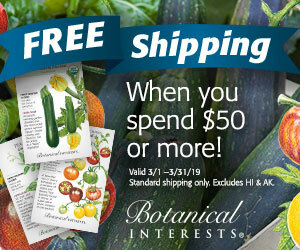 Can’t wait to see that phlox! You’re doing a great job and I’m sure will be surprised someday when a plant you thought you had thrown into the wild and lost starts coming up in unexpected places! When I first moved here it was aways so disappointing to see every self sown seedling turn out to be a weed, but now 9 years later I’m weeding out iris and hellebores and even have seedling primula and cardinal flowers appearing. It just takes persistence and some time… and keep weeding out the invasives… ugh. 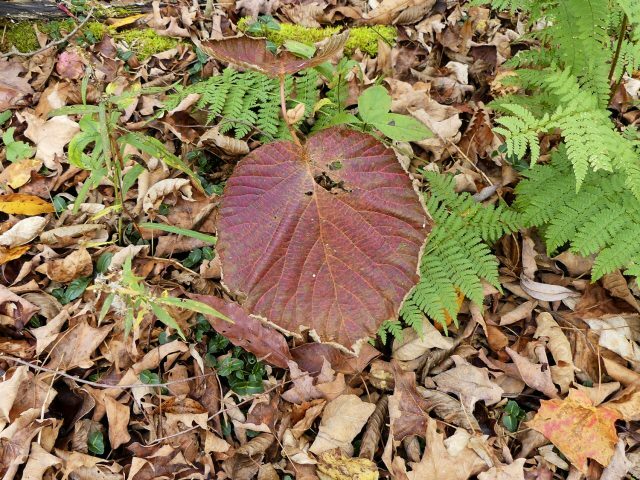 I’ve been growing that Allegheny spurge in Wisconsin for years. Slower to increase than Japanese but much more attractive. I’m zone 4/5. And thanks for the swamp Rhodie tip as I was thinking of planting one in our bog which sounds like the wrong location. Very hard to know what they mean with the water requirements with swamp or bog plants. I distinctly remember that when digging the hole for one of the two that died, the hole kept filling with water as I was digging. That’s how wet it was. I don’t remember how wet the hole was for the one that lived, unfortunately. Just think of swamp azalea growing near the swamp and not in the swamp, and you’ll probably put it in the right place. I really enjoyed reading about your changes and the ruminations behind them. Whether or not we are “improving nature” as we garden is hard to say – but I sure think that you’re aiding natural processes in an excellent way as you increase your native plant diversity and decrease invasives! 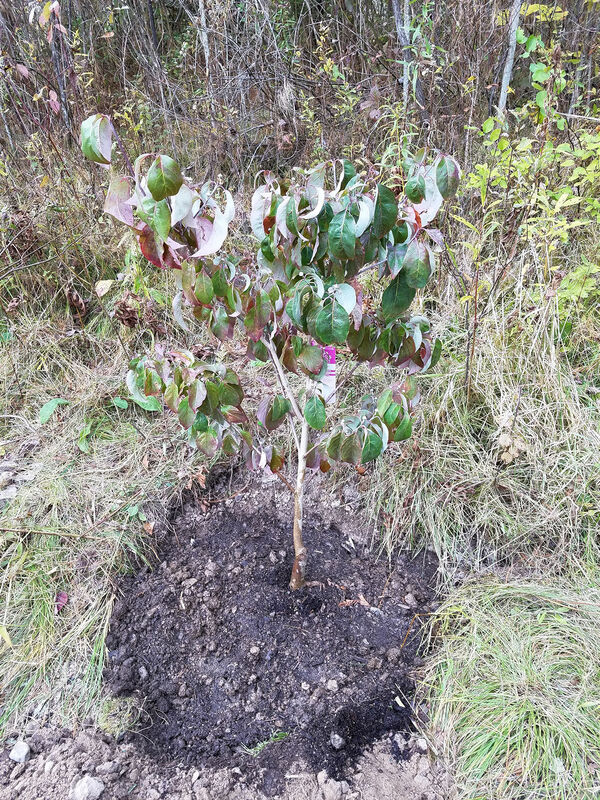 Kathy, I’ll keep my fingers crossed for your dogwood ‘Cloud 9.’ I know that’s where I would be if I could grow one in my (even colder than yours) cold climate. I doubt if we could improve on nature because nature knows best but we can enhance nature. I am sure she appreciates our efforts. You do a remarkable job for nature. You seem to be a very good steward of your land. 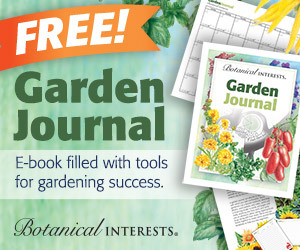 I very much enjoy reading about your garden…it is so very different than mine!